“My fellow Virgin Islanders, I am taking this course of action on your behalf. On behalf of our forefathers, leaders who have sought and attained constitutional advancements in each of the reviews since 1950. On behalf of the many bus drivers that never get paid in a timely manner. I am taking this course of action on behalf of the many Public Servants and the business people especially the small businesses who complain to me every day about how stressful it has become to do business in the BVI…,” explained Hon Fahie. The Leader of the Opposition stated that during the time of the territory’s financial struggles, the territory will need someone who is dedicated and not busy with other matters of the territory. He further stated that the Premier will pay more attention to one portfolio over the other and as a result he feels that the Ministry of Finance is “suffering the most”. The Opposition leader emphasized that he is not on the path to degrade the Minister of Finance and the Premier but instead it is rather to enlightening the people of the territory. The Virgin Islands Party (VIP) opposition leader suggested that the Virgin Islands should be having conversations such as these with the United Kingdom in order to show them that the territory can handle its own affairs. “No way the Premier has the time to oversee the day to day running of finance but him, coupled with the person assigned to oversee the day by day affairs of the Ministry of Finance, coupled with the new Financial Secretary, will be able to turn this financial ship around,” remarked Hon Fahie. 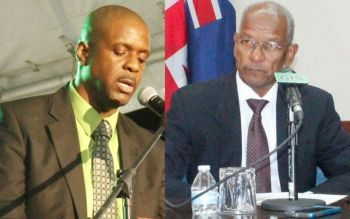 How come Fahie never had so much advice for Ralph? Only if the ndp had listen to Miss P then we all wouldn't be in this predicament. Clearly we need another Minister of Finance. At the end of the day, the motion will fail due to lack of support. This is party politics and although they might want to see change within their leadership, they are certainly not going to have the opposition lead the charge. Period. Dr.Hon Premier D. Orlando Smith is at the apex of the governing triangle and should be focused on the BIG picture. Top leaders in organizations are typically not involved in the day-to-day nuts and bolts or details. The higher one is in an organization the less detail one needs to operate effectively. For example, the Premier does not needs as much details as an administrative manager. Nonetheless, the Premier must set expectations, and put policies, procedures, and structures in place to be kept currently apprised on the state of governing, comparing the planned vs actual and taking action to address the delta. Moreover, the Premier must hire/surround himself with qualified staff(elected and appointed), hold them responsible and accountable, and demand complete staff work. Specifically, the Premier must establish the baseline performance level, define the current performance level and take action to close any performance gaps. The Premier should be able to serve as both Premier and Minister of Finance; he has a supporting staff, ie, PS, FS......etc. He just needs to break out the BIG guava stick. Clearly, the carrot approach needs work. You think leadership is easy. There is a saying that goes like this. who in the kitchen feels the heat!.